This journey is to guide you around setting up your Learner App and building an application for your learners to update their personal details, view their course enrolments, outcomes, attendance, payments, documents and access e-learning. The application works on any internet browser on a data enabled device. Note: Mobile App to access Learner App coming soon! In this stage, you will be designing your Learner App with appropriate brand colours, activating key tabs that you want your learners to access and setup email templates to provide your learners with a username and password. As Portal Administrators you are responsible for the default settings you choose to set for your organisation to use the Learner App. This is to guide you on how to view and edit settings in the Portal. These settings allow you to control the information that is able to be accessed by your Learners. You do not need to update all of the fields but only those that are relevant to your delivery and organisation. To do this you need to have LRM Admin access. By default they are inactive. In this stage, you will learn how to invite learners to the Learner App/E-Learning and also customise Usernames and Expiry Dates. Learner App or E-Learning access can be set for a single learner or for multiple learners. In the process of enabling Learner App or E-Learning access you can select which Course Offers you want Learners to be able to see. Learner App or E-Learning access can always be viewed per Learner by going to the Learner Profile screen and selecting Learner App in the left navigation. Modify the default settings as required. 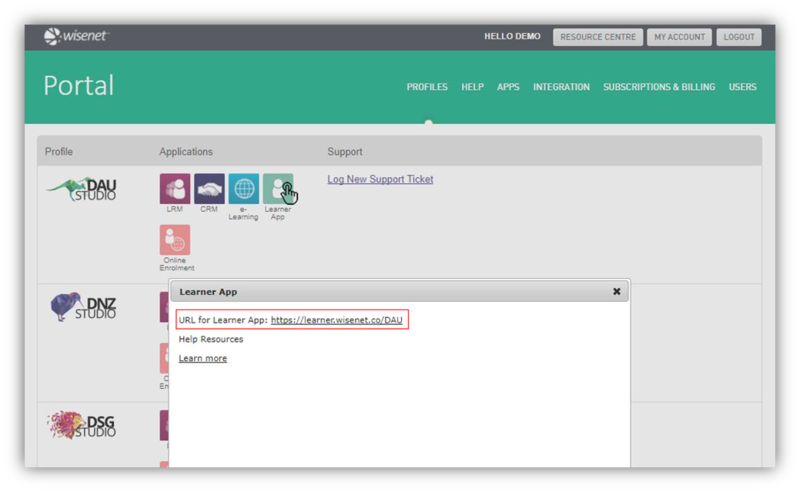 The Learner App Username can be edited separately from the Learner’s email address. This information is useful if you wish the Learner to have a different Username than their email address. We recommend however that you try to keep them both the same value. By default, the Learner App expiry date is set to max course enrolment end date. If you require learners to have a different expiry date, you can either bulk update the expiry dates from the course offer > enrolments > manage learner app action ‘or’ set it under the client profile > Learner App page. This step is optional and should be completed only if you are wanting to test your Learner App settings and see what your Learner will experience. From the Action Menu, Select Send Invitation and this will send an email with the username and password. In this stage, you will learn how to use Learncycles to automate the Learner App or E-Learning access invitations saving you time in sending them manually. This stage will also help you to bulk send the invites if you are on one of our classic editions and do not have Learncycles. Learncycle activities can be described as a set of rules and conditions that you can create to then trigger a desired action/outcome in Wisenet. In the Learncycle section of a Course Offer you can set an activity to send the Learner App invites. In this stage, you will learn how to troubleshoot email failures, forgotten passwords, username changes and date issues. Admin Reset – As an administrator, you can send the reset password email to a learner if they are requesting for a new password via their Learner profile > Learner App page. Learner Reset – As a Learner, they can reset their own password by choosing the reset password option on the login page if the Learner has forgotten the password. Or, if the learner wants to create a new password, they can simply go into their account settings and create a new password. How do I set a custom expiry date in bulk for the LearnerApp access? You can set a custom expiry date in bulk by going into Course offer > Enrolments > Manage LearnerApp and E-Learning access > Choose custom under ‘Set Learner App Expiry Date to’ > Choose the appropriate date > Save. How do I upload a logo to my LearnerApp? Wisenet will have to upload the logos at the moment. Please raise a support ticket and send us your logo in either a .jpeg or .png format. The good resolution image is preferred. Check if the LearnerApp email templates are activated under Settings > Email templates. If not, please see how to set up your Learner App Email Templates in the ‘Set Up’ tab on this page.